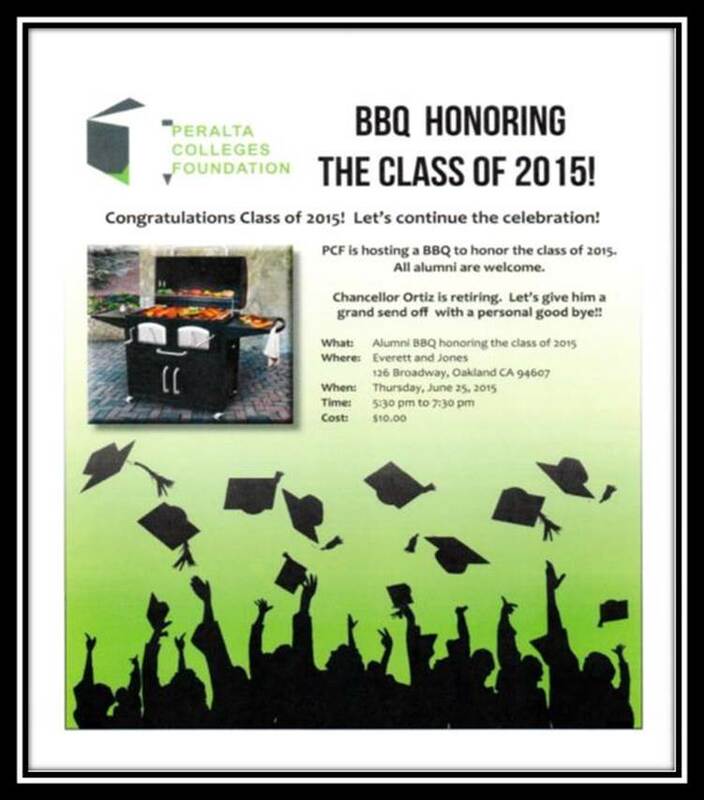 On Thursday, June 25, 2015, the Peralta Colleges Foundation will host its annual Alumni BBQ Honoring the Class of 2015. The event will be held at Everett and Jones, 126 Broadway, Oakland, from 5:30 p.m. – 7:30 p.m. The Peralta Colleges Foundation was established in 1971 to support academic excellence and success throughout the District. We accomplish this by building partnerships to raise scholarship funds for committed students along with providing financial support to the Peralta Community College District’s four campuses. Your generosity enables us to further enhance the intellectual, cultural, and educational needs of our students, faculty, and staff. June 25th will be a special event congratulating the Class of 2015. All alumni of Berkeley City College (formerly Vista), College of Alameda, Laney College and Merritt College are invited to attend. In particular, Chancellor José Ortiz is retiring. Let’s give him a grand send off. The community is welcomed to attend, as we seek to expand our reach and work of Strengthening Education in our Community. For more than 50 years, Peralta Community Colleges have been a vital source of economic development and growth within our region. The Peralta Colleges provide training needed for our students to meet the needs of today’s job sector. Their Scholarship Program further assists recipients with academic advising and personal development seminars, along with a stipend to defray the cost of attending college. For more information, call 510-587-7809. To purchase tickets click here.